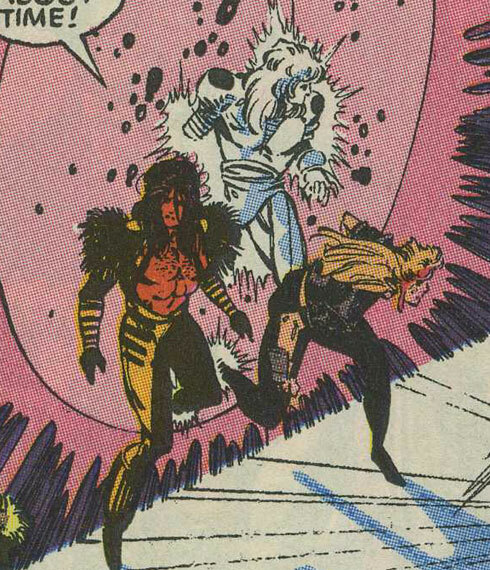 Powers/Abilities: Kroeger had the ability to generate an unknown form of energy and had white skin. Burke did not display any superhuman powers, but had red skin. Stylles also did not display any superhuman powers. History: (Uncanny X-Men#282 (fb) - BTS) - In order to become free, Burke, Kroeger, and Stylles agreed to work for Trevor Fitzroy. (Uncanny X-Men#282) - Once Fitzroy had arrived on Earth-616 and captured the White Queen and her Hellions, he drew energy from Tarot and generated a temporal portal that brought Burke, Kroeger, and Stylles to Earth-616 as well. As soon as they arrived, Fitzroy reminded them of their pact with him, but Kroeger, thinking himself a free man, declined to work for Fitzroy. Trevor Fitzroy then tricked Kroeger into thinking that he had the upper hand and offered Kroeger a portal back to Earth-1191. Kroeger quickly agreed, not realizing that the portal was one-way. As soon as Kroeger entered the portal, his energy was absorbed to power it anew and Kroeger was instantly killed. The X-Men soon arrived to rescue the psyche of Jean Grey, which was active in the body of the White Queen, and the group made quick work of Burke and Stylles. (Uncanny X-Men#283-285 - BTS) - Burke and Stylles were executed by Bishop, Malcolm, and Randall because they had no means of easily returning them to their own world to face incarceration. Comments: Created by John Byrne, Whilce Portacio, and Art Thibert. The few panels that these guys appear on don't help to distinguish them. According to both a scream in Uncanny X-Men#282 and the Official Marvel Index to the X-Men II#5, the white guy who got killed was definately Kroeger, despite the fact that Fitzroy refers to the red guy as Kroeger when they first arrive, even though Fitzroy later apparently realized his mistake and began calling the white guy Kroeger. I believe that the panel where Fitzroy called the red guy Kroeger was a mistake of coloring or the word balloons were coming out of the wrong mouths. So, in an effort to better distinguish them, here's an easy explanation of who is who: Kroeger is the white guy, Burke is the red guy, and Stylles is the Caucasian.